I just had an email conversation with Harold Ng (Yobokies) in HK about this subject. I've noticed that a lot of people are looking for proper, good quality Swiss Tropic straps. The strap the AD would sell you for your Rolex and Blancpain back in the 60s. I know that NOS straps are sold on eBay, I know that the same guy is selling look-alikes. But... the NOS are more than 40 years old, and the material used for these straps in the 60s is aging. The look-alikes aren't worth the money you have to pay for them: ill fitting, inferior buckle etc. In short, I would love to see a modern interpretation of the Tropic strap (or the waffle strap for that matter), with modern materials, but suited to be worn on a vintage watch. And please, please, make a 19mm version! As you know, a lot of older watches have a 19mm lug width! Secondly, I still would love to see the ATG interpretation of the IWC velcro (Aquatimer) strap. 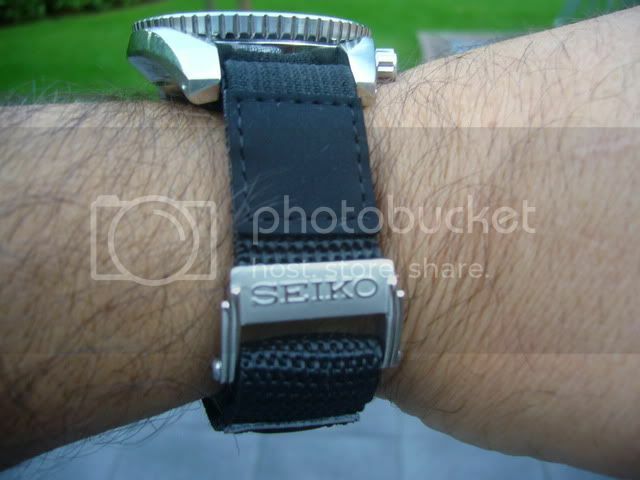 About velco: I bought a velcro strap for my Seiko Sumo from Yobokies. It's a great quality strap, with padding between the strap and the case back (!) for about $15.00 incl. shipment. Your straps look great, and good value compared to the standard offerings. and maybe a military strap. All sound like winners, especially the ballistic nylon utility (thicker than the Natos, etc., I hope) and the stitched Blancpain style..
As long as you are doing rubber too, maybe consider a tuned up version of those old Tropic straps, the perferorated diamond patterned ones? The look was classic, and the underside surface reliefs combined with the venting perforations make them more comfortable than straight rubber. I for one though, need a 200mm or sligthly longer strap. Maybe a little thicker than traditional tropics too, at the lugs, to match current watch trends, and a 2mm taper. I don't know if it would be upscale enough to match your current market point though. I totally agree with every word! For what its worth, I'd love to see a high-quality reproduction of the Corfam straps as used by Heuer. I've seen several attempts, but can't find ones that have the same sheen. 20 & 22MM straight end, as mentioned above, thicker at the lugs since modern lug shoulders tend to be taller, 2mm taper rather than down to 16mm, a real cool touch would be a buckle styled like the old Acier Inox buckle but more substaintial. If you need any pix for reference or design shoot me a PM as I have a couple N.O.S.'s. what about short length options for small wrists?